Facebook has published a report on the way the Independent uses the social network to share content. The study has found people liked or shared content from the Independent 136,000 during a “recent” month. These actions were then seen 68,845,050 times on Facebook, with a click-through rate of 0.53 per cent. The study also found “each action through a social plugin”, such as the recommend button, has driven an average of 2.67 referrals back to the Independent. It also found Facebook referrals result in readers spending an average of seven seconds longer on a destination page. The Independent’s success in engaging with readers using Facebook and traffic referrals form the social media site increasing by 430 per cent last year has been well documented by Journalism.co.uk. Jack Riley, the Independent’s head of digital audience and content development explained in this post and this podcast, how the Independent has created specific Facebook pages for football teams and columnists such as Robert Fisk, whose page has accumulated more than 24,000 fans. The first stage of the implementation of the Independent’s Facebook strategy involved adding the recommend plugin at the top and bottom of the article; the second involved the creation of open graph pages for columnists and sports teams. This entry was posted in Social media and blogging, Traffic and tagged Facebook, Jack Riley, social media, social network, the Independent on August 17, 2011 by Sarah Marshall. Slate Magazine’s Slatest blog introduces a new way of visualising stories: ‘News Dots’ presents the most recent topics in the news as a giant social network. This entry was posted in Editors' pick, Multimedia, Online Journalism and tagged news dots, slatest, social network on September 9, 2009 by Judith Townend. Back in February last year, Journalism.co.uk caught up with Ryan Sholin, director of News Innovation at Publish2, about his project ReportingOn, which had received funding from the Knight News Challenge. “I call ReportingOn ‘the backchannel for your beat,” Sholin told us. What changes are being made that will affect the user? [Sholin] It’s an absolute re-imagining of the network. The first time out, I built it to be quite Twitter-esque in the hopes that journalists would use it like Twitter, asking questions of their followers and sharing ideas about stories they were working on. That didn’t happen organically, or if it was going to, it was going to take years. Why was it necessary to make these changes? Although the first version of ReportingOn was a great proof of concept, a fun experiment, and a solid first iteration of the network, doing all the development myself didn’t produce a feature-complete, extensible codebase that I could open-source and let the community build on. I wanted to take the next step to develop a backchannel for beat reporters that could be used as is, or reproduced as a question & answer tool for any purpose, especially by a news organization. Has this involved significant amounts of back-end work/technological change? Most definitely. The site has been completely rebuilt. It’s still built on the Django platform, but rather than me teaching myself this style of programming in the middle of the night and at the crack of dawn to demonstrate what one curious journalist might be capable of, it was built by the professional team at Lion Burger, who are also responsible for tools like Snipt.net and recently built afeedapart.com for the popular ‘An Event Apart’ series of Web design conferences in the US. This entry was posted in Handy tools and technology, Online Journalism and tagged answer tool, curious journalist, director of News Innovation, Journalism.co.uk, ReportingOn, Ryan Sholin, Snipt.net, social network, Twitter, United States, Web design conferences on July 1, 2009 by Laura Oliver. Allvoices has launched an incentive program to reward its citizen journalist contributors for their work. Contributors will be paid in relation to the quality of their submissions e.g. copyright violations of texts or photos are ineligible. The amount of money is dependent on the feedback from the community and strength of the user’s profile. – New or infrequent contributors, who organise their social network based around their work. – Has had a minimum of 10,000 views for their contributions and 25 fans. – Pay scale in this category is $0.25 per 1,000 page views. – Minimum total of 25,000 views for their work and 50 fans. For every 1,000 page views they earn $1.00. -Anchors are influential contributors beyond their social network and are closely followed by the Allvoices community, says the release. – The criteria for being an Anchor is at least 100,000 views and 75 fans. – Potential pay rate is $2.00 per 1,000 page views. This entry was posted in Citizen journalism, Online Journalism, Social media and blogging and tagged Allvoices.com, Citizen journalism, incentive program, journalist, reporter, social network, USD on May 11, 2009 by Katarina Witzheller. You’d be forgiven for confusing it with CNN’s iReport, similar name, similar project – US broadcaster Fox has expanded its citizen journalism initiative, uReport, onto MySpace [though can’t seem to find a working link yet]. The social network has already dabbled in some user-generated news coverage, having teamed up with MSNBC for US election coverage. This entry was posted in Citizen journalism and tagged CNN, Entertainment, Fox, msnbc, Myspace, News Channel, Politics, social network, United States, uReport, World on April 22, 2009 by Laura Oliver. News Mixer, the final year project of programming-journalism students at Medill School of Journalism at Northwestern University aimed at breathing new life into commenting systems on news sites, was always intended to be developed and adapted further by third parties. “We got a lot of the hard work out of the way and the code is out there for anyone to play with (…) it’s free. Use it,” Brian Boyer, one of the developers behind it, insisted in an interview last year. The open source nature of the project has allowed three developers from e-Me Ventures to create Iowa Content – a WordPress-based widget that aggregates localised news content from a range of sources and is connected to Facebook Connect. Iowa Content is based on News Mixer’s quip function – short-form responses to news items, ideally suited to Twitter or Facebook status updates. 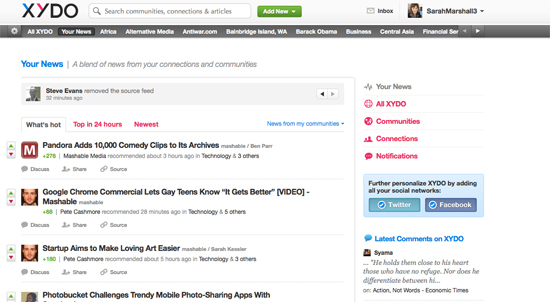 Being linked with the social network will encourage readers to discuss and comment on the news – as well as share links via their profiles. This entry was posted in Handy tools and technology and tagged API, Brian Boyer, e-Me Ventures, Facebook, Iowa, Medill School of Journalism, News Mixer, Northwestern University, social network, Twitter, wordpress on January 28, 2009 by Laura Oliver. Marketing-Interactive reports on stats from Omniture SiteCatalyst that suggest CNN attracted 136 million page views and served a record 21.3 million live video streams on CNN Live, as of 3.30pm (EST) yesterday. According to the report, CNN Live’s use of Facebook boosted the figures with an estimated 1 million users updating their status on the social network through the CNN site. 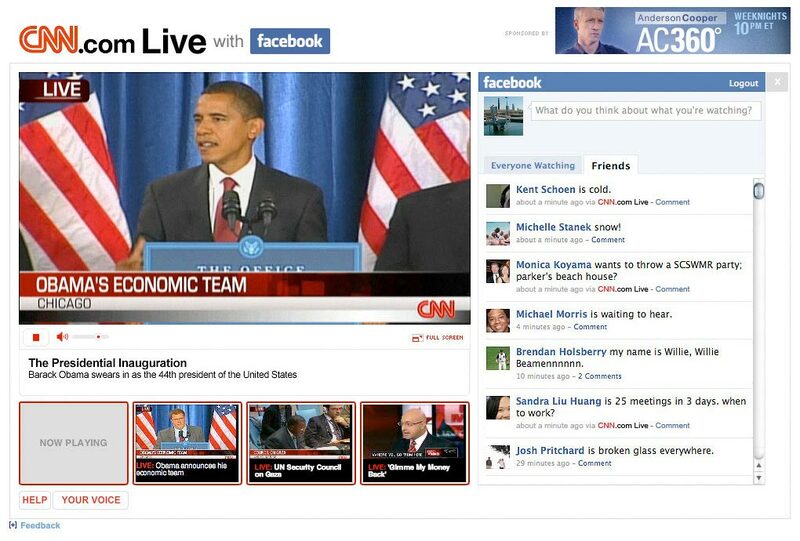 This entry was posted in Broadcasting and tagged #inaug09, CNN, Facebook, inauguration, online inauguration broadcasters, social network on January 21, 2009 by Laura Oliver.